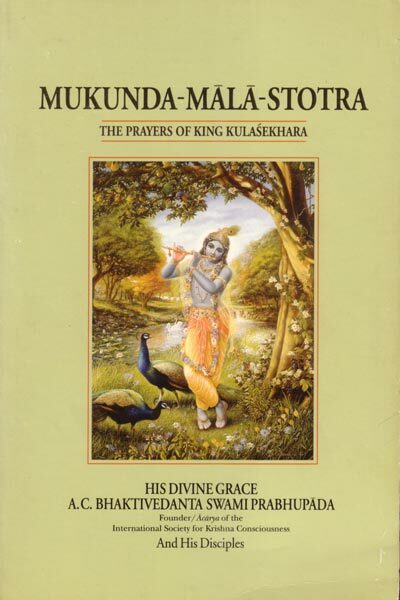 Of the many hundreds of poetic Sanskrit stotras—songs of glorification offered to the Supreme Lord, His devotees, and the holy places of His pastimes—King Kulashekhara's Mukunda-mala-stotra is one of the most perennially famous. Srila Prabhupada frequently enjoyed citing certain favorite stanzas from it. The Mukunda-mala-stotra, although composed in elegant Sanskrit, is a simple expression of King Kulashekhara's devotion to Krishna and his eagerness to share his good fortune with everyone else. Like most other works of the stotra genre, it aims less at presenting a plot than at vividly and honestly expressing the true feelings of a lover of God. With deep humility he repeatedly begs simply to be allowed to take his next births as a bird, fish, or flower in the place where Lord Krishna enacts His pastimes, and in this way to enjoy the association of His devotees. The saintly king Kulashekhara lived more than a millennium ago in India, yet his Mukunda mala stotra speaks to us today with the fresh voice of eternal truth. It is the voice of a realized soul beseeching the lord—and us—with the utmost sincerity. Here is how he calls us to our salvation. "O people, please hear of this treatment for the disease of birth and death! It is the name of Krishna. Recommended by Yajnavalkya and other expert yogis steeped in wisdom, this boundless, eternal inner light is the best medicine, for when drunk it bestows complete and final liberation. Just drink it!" The first part of the Mukunda-mala-stotra contains a commentary done by His Divine Grace A.C. Bhaktivedanta Swami Prabhupada, recognized by scholars and spiritual leaders worldwide as the most distinguished teacher of Indian culture and philosophy of the modern age. The latter part contains commentary by Satsvarupa das Goswami, one of Prabhupada's senior disciples and the author of more than two dozen books on devotional life.